Wyoming began discussions with the federal government this summer about crafting a plan for Medicaid expansion. As Wyoming voters look toward the November general election, candidates for governor have staked out their positions on Medicaid expansion. Democrat Pete Gosar and Libertarian Dee Cozzens say they would expand Medicaid, while incumbent Gov. Matt Mead (R) says he is committed only to looking at options for a negotiated expansion that takes into consideration Wyoming’s specific needs. Independent Don Wills stands opposed to an expansion. Whether Wyoming joins the growing list of states that have expanded Medicaid depends in part on the outcome of this election. 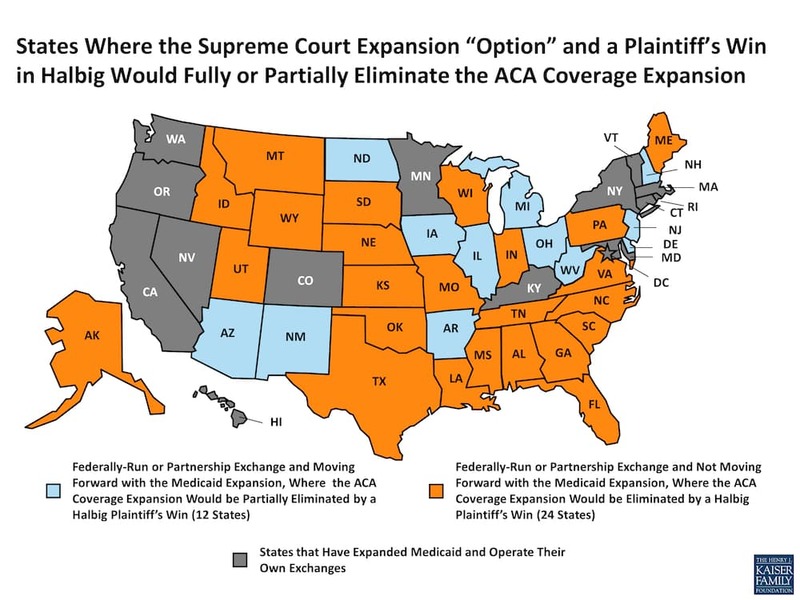 At last count, some 28 states (including Washington D.C.) have accepted Medicaid expansion, while 21 states are not moving forward with the program. 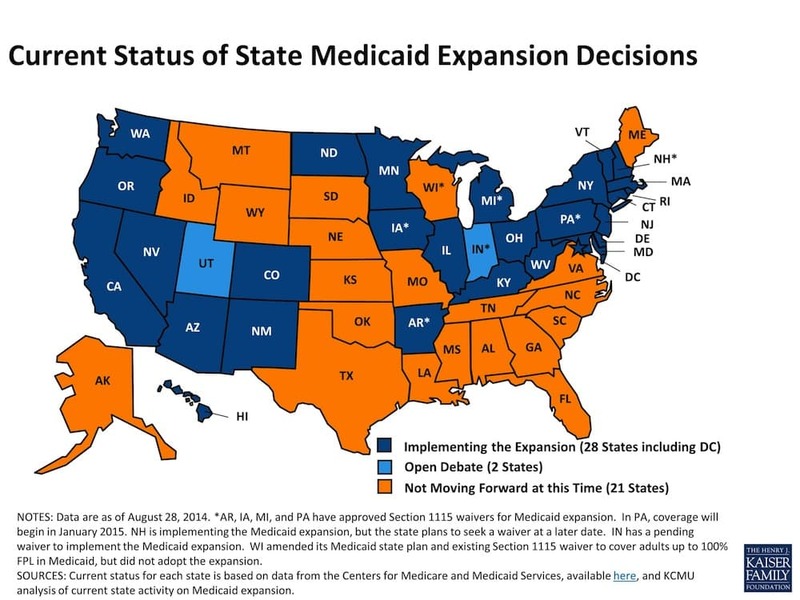 Ten Republican governors have supported Medicaid expansion, so far. 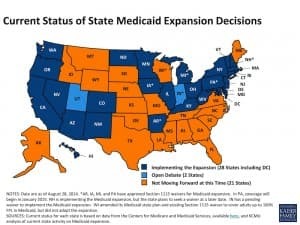 Republican governors in Pennsylvania, Utah, Indiana, and Tennessee are the latest to seek approval for their state-based Medicaid expansion plans. At the end of August, the Center for Medicaid and Medicare services approved Pennsylvania’s plan for expanding healthcare coverage to the uninsured. The plan would use federal money to provide subsidies for consumers to buy private health insurance, while not expanding Medicaid. Utah has a similar plan to provide insurance subsides in lieu of Medicaid expansion, but progress on the plan is stuck because Gov. Gary Herbert (R) insists on the inclusion of a work requirement for able-bodied adults receiving the subsidies. The federal government has rejected every work requirement proposed by states. Indiana’s plan to use federal dollars to expand its health savings account program for residents in the Medicaid gap awaits approval from CMS. Tennessee is expected to submit a plan for Medicaid expansion in the coming weeks. Though national media outlets have suggested Wyoming is close to joining other states that are giving expansion the green light, statements from Mead make that assessment premature. As WyoFile has reported, Mead is exploring Medicaid expansion even as he opposes it. In the midst of his run for reelection in November, Mead has been careful to couch his negotiations on Medicaid expansion as a response to the legislature’s footnote requesting meetings with the Center for Medicaid and Medicare Services (CMS). In his 2013 state of the state address, Mead said he would like the state to create its own plan for Medicaid expansion. 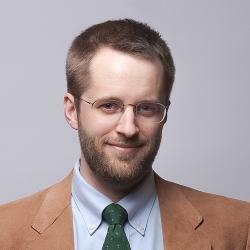 The Department of Health had prepared some options and cost projections for expanding Medicaid by November of 2012, but no negotiations took place with the federal government until they were authorized by a budget footnote in the 2014 legislative session, which originated with Rep. Eric Barlow (R-Gillette). See page 119 of the budget bill here to read the footnote. Meanwhile, Sen. Mike Enzi (R), who running for another term in the U.S. Senate, says Wyoming should keep its guard up when accepting federal dollars for Medicaid expansion. Proponents of expansion point out that Wyoming accepts billions in federal dollars for other programs without questioning whether those dollars will be there in the future. According to the Equality State Policy Center, not accepting Medicaid expansion has cost the state nearly $80 million in federal dollars this calendar year. 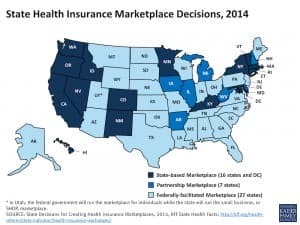 The Urban Institute estimated that Wyoming would forego $1.4 billion in federal funds from 2013 to 2022 if the state bypasses Medicaid expansion altogether. The state’s projected cost to expand Medicaid during that time is $118 million, according to the study. By comparison, Wyoming is looking to spend $259 million before 2017 to restore the State Capitol Building, and $110 million to rebuild the college of engineering at the University of Wyoming. Overall, the Urban Institute concluded that for every dollar states spend on Medicaid expansion, they would receive a match of $13.41 in federal funds. The earliest possible new development in Wyoming’s Medicaid expansion negotiations may come through a Department of Health briefing to the Joint Labor, Health, and Human Services Interim Committee meeting on October 16 and 17 in Evanston. The deadline for the Department of Health to finalize its report on Medicaid expansion options is November 1. That means the committee is unlikely to take action on any expansion proposal until its December 15–16 hearing in Cheyenne. Whether Mead intends to weigh in on his specifics for a Wyoming plan before the November 4 election remains uncertain. The state’s footnote calls for consideration of a plan that includes cost-sharing, and health savings accounts, among other features. In an email to WyoFile last week, Mead’s spokesman Renny MacKay said the governor recognizes there is a general consensus that Wyoming needs to find a solution for the 17,000 people who fall in the Medicaid gap. People in this group make too little money to qualify for subsidies on the health insurance exchange, but also don’t qualify for the traditional Medicaid programs. MacKay said Mead is interested in negotiating with the federal government to explore the best Medicaid expansion options for Wyoming, which would then be offered up to the Wyoming legislature for consideration. 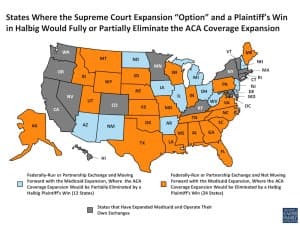 If Wyoming were to adopt an expansion plan that includes federal health insurance subsidies for private insurance, that plan could be scuttled by the federal Halbig v. Burwell case. This case challenges the authority of Center for Medicaid Services to provide healthcare subsidies to states using federal insurance exchanges. It does so by pointing to language in the Affordable Care Act that says subsidies will only be provided to state-run exchanges. This language apparently survived in the law even though the intent was to provide subsidies to all states. Last week a panel of 13 judges from the federal Appeals Court of Washington D.C. announced it would hear Halbig vs. Burwell. Mead’s Democratic challenger Pete Gosar says he would support simple Medicaid expansion at first, and then tailor the program to Wyoming’s needs at a later date. As a Democrat in a majority Republican state, Gosar would likely face a challenge in getting traditional Medicaid expansion passed by the legislature. He says he would rally support with a public relations campaign that would explain why Medicaid expansion is important for local hospitals and clinics that are on the edge of closing their doors due to the costs of uncompensated care. Importantly, Wyoming people need to be confident that if the federal commitment to Medicaid changes, Wyoming has a plan for how to withdraw from expanded Medicaid, Gosar added. The budget footnote passed by the legislature earlier this year specifically calls for the state to investigate the use of health savings accounts in its Medicaid expansion plan, which could resemble Indiana’s plan. Gosar said he’d be open to considering the use of health savings accounts. Gosar said his plan for health care reform would go beyond Medicaid expansion by looking at wellness programs as a way to reduce costs. He noted that some school districts have wellness programs that include nutrition, coaching, and accountability. Wyoming’s past attempt at a statewide prevention program, Healthy Frontiers, shuttered its doors after the legislature cut its funding in 2012. The two minor party candidates for governor have positions on Medicaid expansion that represent the broad spectrum of Wyoming voters’ opinions on the issue. ”I am against Medicaid expansion in Wyoming because it has federal strings attached,” said Independent candidate for governor Don Wills of Pine Bluffs. ”Free money is like free beer — it’s really not free. Once you commit to Medicaid you can’t get out of it. In out years, the federal government pays a smaller and smaller percentage of the cost” — meaning that once Wyoming gets past year No. 2, the cost-share dips to 90 percent federal monies. In the past legislative session, several unsuccessful proposals for Medicaid expansion contained triggers that would allow Wyoming to back out of the federal Medicaid expansion program if the federal cost share dropped below a certain level. When the state of Arizona expanded Medicaid, its plan had a stipulation to that effect. Wills said a higher priority for him is getting the state’s employees’ pension system in order, which is currently underfunded. Libertarian candidate Dee Cozzens of Lovell is a supporter of Medicaid expansion. He said he’s worked for 40 years as a hospital administrator in Cody and Powell, and now works at the Worland Healthcare and Rehabilitation Center, a nursing home. Cozzens believes expanded Medicaid can provide people with the boost they need to get back on their feet so they can contribute to the state.